The color of this skirt about knocked my socks off when I saw it in the store. The camera doesn’t even capture how vibrant it really is! Definitely a WOW when you see it in person.. Such an amazing skirt! love how you pared it! 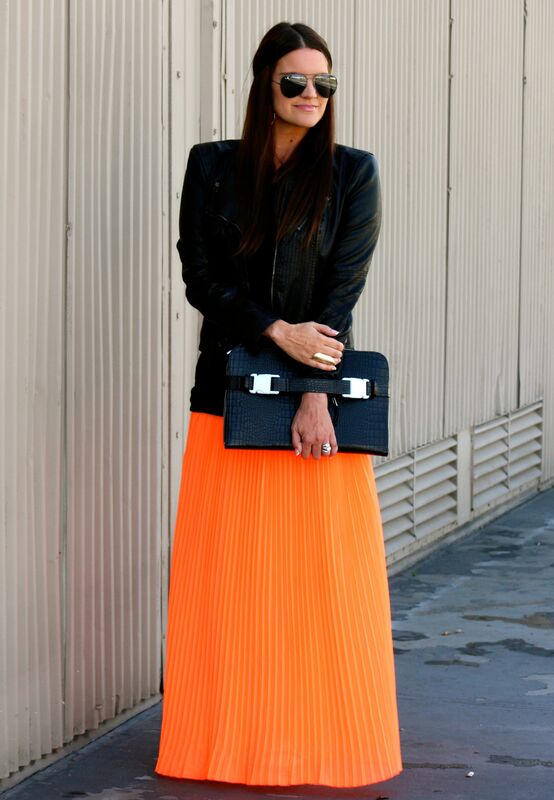 Definitely crushing on the pop of orange here, very lovely Shauna! That skirt is such a fun and pretty color! It looks so good with the black! That skirt is gorgeous, but I’m totally loving that clutch! So cool! Also, I love that you paired orange and black together, I’m always so nervous to do that in fear of looking to halloweenish, but this totally works and I love it! Not sure what I love more, the clutch or the skirt? You look gorgeous! The maxi is gorgeous, what a great color! omg I love love this !! Awesome color! That skirt is fabulous the huge pop of color against the black is just gorgeous on you!! Gorgeous look! I love your maxi skirt and it looks amazing with that fun clutch! I just love that arm sleeve- it’s so convenient. I want to hate you so much with this weather but I can’t, because your outfit is amazing! I am loving that skirt and paired against the black, it looks even more vibrant! I love that skirt on you! You look fantastic! Biiiiiiig fan of a brightly-colored maxi! And how fun will this piece be in the summer with a white tank?! THIS ORANGE MAXI IS GORGEOUS! Love love love! That skirt is so striking and loving your chic clutch!! This look is perfection! Seriously in love with that skirt! The color is insane! Absolutely stunning!! Love that skirt! Shut up, I am in love with this outfit!!! The skirt is fab, but your clutch is amazing!! Favorite look of yours!!!! That pop of orange looks absolutely amazing on you. Loving this look. I love that skirt, it is amazing! Oh so lovely, thanks a ton for sharing! xo. Happy Tuesday! You are just too cute! YOU look amazing in this skirt!!! Super cute skirt!!! Love the color and how you paired it with the Moto Jacket!!! 80? that is just not fair… enjoy your early summer! Fab burst of color with the skirt, back and orange can be tricky, but you’ve pulled it off. Love that orange pop! Take the hint spring! ha. This skirt is beyond amazing! I love the vibrant against the black! Love this outfit! You look awesome and this maxi is awesome! You look stunning! I love everything about this and especially that you paired it with all black! I really love that skirt and how you paired it with black! That pop of color really makes the look! I am in love with this skirt, the color is stunning!! I have been loving the weather lately too, we even went to the beach over the weekend! You look stunning! This skirt is awesome!! Love the whole look. So jealous of your warm weather!! 🙂 Beautiful skirt! Rub it in! I’m frozen over here on the East! That color is really WOW. I can only imagine what it is in person- probably perfect for those 80 degree temps you have been having! Lucky you! I’m the biggest fan of colour so I just love your skirt. Can’t wait til Spring! You look amazing! Loving that orange lately, too! Love your lipstick/gloss too!